Am I wasting money on the advertising I’m doing now? Which advertising methods will work for my business? The advice you get when you ask this question will change depending on the incentives of the person you are asking. If you ask a Yellow Pages Sales Rep for their opinion they’ll say “Yellow Pages advertising”. If you ask a website designer they’ll say “a new website”. Those are just opinions and they don’t matter. The only opinion that matters is your clients. I’ve been using Google Calendar for many years, but I only recently found this function, and now I couldn’t live without it. This function is especially handy when you need to repeat an appointment with a large number of invited guests. 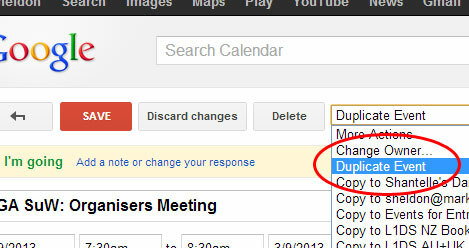 I’m a huge fan of Google Calendar. I even switched my reluctant wife over to it rather than her diary book, and now she loves it too. If you use Google Calendar and you use it to invite people to appointments and events, you need to occasionally cancel appointments, right? And my question was, “if I do not notify guests, does the calendar appointment get sneakily removed from their calendar without them knowing?”. And after an experiment today, I can confirm this is true. He did not receive any messages at all, but when he checked that time slot, the appointment had magically disappeared! I wouldn’t use this technique for one-off appointments because it’s good to give guests a heads-up, but this could be useful in a series of re-occurring appointments when you need to cherry pick certain ones to cancel well ahead of time. Imagine you have a series of weekly appointments and you need to cancel appointment number 10. If you choose to notify them of the cancellation, they receive the cancellation email, and they assume it is the very next appointment that is being cancelled (i.e. appointment number 1), which causes a lot of confusion. That’s happened to me several times, has that happened to you?